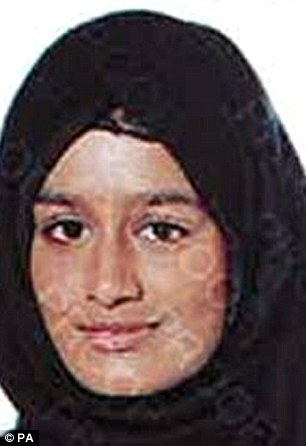 A traitor ‘Jihadi bride’ who sees nothing wrong with butchering defenceless prisoners in cold blood and who is pregnant with a next generation benefits terrorist wants to come back to Soft Touch Britain – and the Tory government says that she is entitled to do so. The remorseless schoolgirl, who quit London to join ISIS, has been found heavily pregnant in a refugee camp and said: ‘I don’t regret coming here – now all I want to do is come home to Britain’. 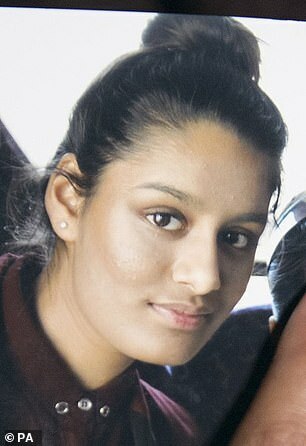 Jihadi bride Shamima Begum was just 15 when she and two classmates Kadiza Sultana and Amira Abase travelled to Syria in February 2015. She is the only known survivor of the three friends from Bethnal Green and her two children died of disease and malnutrition as the caliphate fell apart around her. With her third baby now due any day, she says she has decided to quit ISIS and now wants to ‘live quietly’ back in the UK. Her family’s lawyer Tasnime Akunjee, who represented the parents of all three girls, today insisted that Shamima is a ‘victim’. Begum is now in the al-Hawl refugee camp near Syria’s north-eastern border with Iraq – 200 miles north of ISIS’ last stand in Baghuz. In an extraordinary interview with The Times she said: ‘I’m not the same silly little 15-year-old schoolgirl who ran away from Bethnal Green four years ago. And I don’t regret coming here. ‘I know what everyone at home thinks of me as I have read all that was written about me online. But I just want to come home to have my child. That’s all I want right now. I have to think my baby’. In other words, she sees nothing wrong with beheading a defenceless Prisoner Of War – which rather suggests that she’s not entirely at one with “British values”! Still, handing taxpayers’ money over to alien ingrates who hate us is by now a Tory ‘tradition’, so once she’s back and housed in a brand new flat at our expense at least the elite liberals will be happy! The 19-year-old says she does not regret joining the terror group and said she was ‘weak’ for not staying to the bitter end. Begum refused to say what she had done for ISIS other than marry a fighter and have his children. Security Minister Ben Wallace today confirmed that Begum ‘has a right to come home’ and will be allowed back into Britain if she presents herself at a British consulate in Iraq or Turkey. ‘British citizens have rights whoever they are but if they have gone join ISIS and return to the UK they can expect to be questioned and, if possible, prosecuted’. He added: ‘Actions have consequences. I think the public will be reflecting on why these people want to return to a country they said they hate’. Indeed, but we also question why the government would let them return. At best, she and her new baby Jihadi will be welfare parasites. At worst, she will bide her time and continue with her Islamic ‘holy war’ against innocents in Britain. There is certainly very little chance that she will be brought to justice. While the majority of people who have returned from fighting against ISIS have been prosecuted, Britain has only prosecuted 40 citizens in five years who fled to join ISIS and then came back. In 2018 security Minister Ben Wallace told MPs 400 Britons who travelled to join ISIS returned home – but only one in ten were put in the dock. Just keep paying your taxes!